(November 25, 2016) – Featuring superior color saturation and vibrancy, WideBeam™ LED Technology from CableMod® brought a compelling lighting solution to PC modders the world over. Today, CableMod is ready once again to shake up the world of PC illumination by releasing WideBeam Hybrid LED Strips – the next revolution in LED lighting. CableMod WideBeam Hybrid LED Strips combine two different types of LEDs on a single strip. 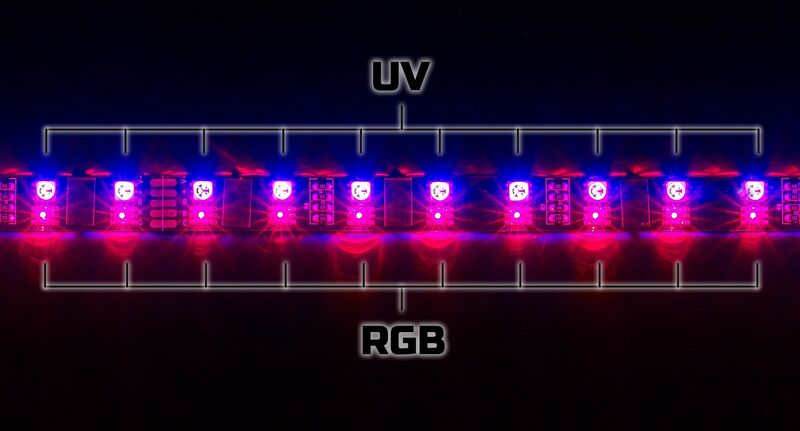 The first type is the same WideBeam RGB LEDs that are featured on our original RGB LED strips. The second type is a more focused UV LED, which is designed to better reach and illuminate UV reactive components inside the chassis. By combining these two LEDs, CableMod WideBeam Hybrid LED Strips deliver a lighting solution that allows the user to highlight their UV reactive components, while simultaneously selecting a background color – a truly unique lighting effect. Combining two different types of LED onto a single strip really shows its convenience with the included 40-key remote control. 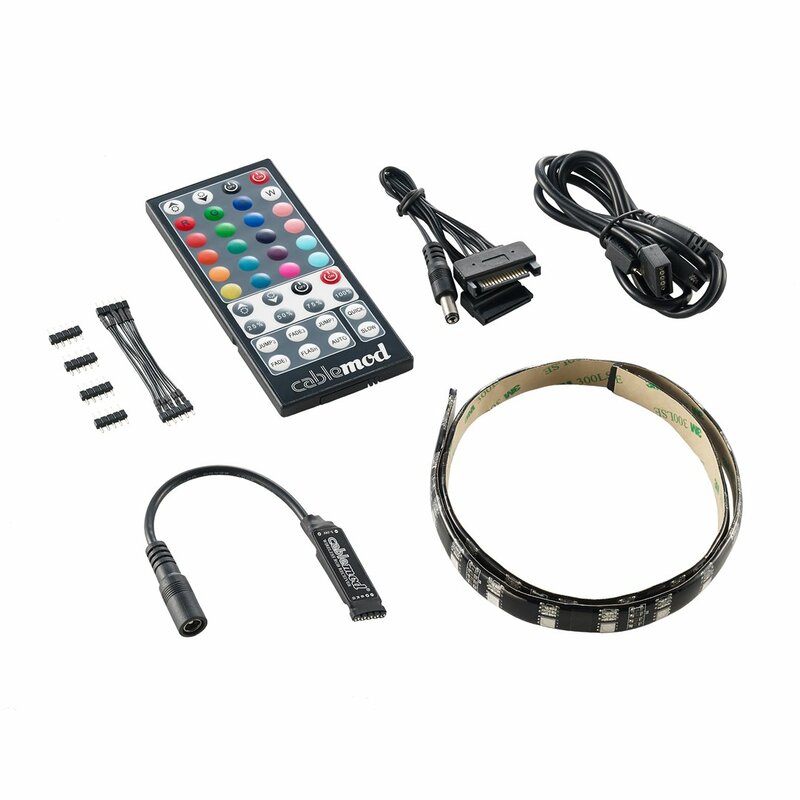 This remote allows users to control both the RGB and UV lights independently with a single unit. And because the remote uses RF technology, line-of-sight is not necessary for operation, which gives added flexibility for receiver placement. But WideBeam Hybrid LED Strips don’t just combine LEDs – we’ve also incorporated two types of adhesive on each and every strip. Users with magnetic cases can take advantage of the rare-earth magnets embedded underneath the strip’s waterproof coating, enabling them to securely place their LED strips while being able to easily reposition them at any time. For users with cases made out of aluminum or other non-magnetic materials, a strong 3M adhesive lines the bottom of the strip, making these strips stick to virtually any surface. Is it possible to control the RGB with something like the Asus Aurora? With it being a 5 pin, could a harness be made to control the RGB with the 4 pin, then power the UV with seperate header? Sorry I meant the Asus Aura not Aurora. Hi Mike – You can power the RGB by connecting the +, B, R, G pins, but because the + pin is shared between both LED types, I’m not sure how you would successfully control the UV LEDs as the + pin is presumably connected to your Aura header. When will these be available in your Canadian distributors? Will they be available in the magnetic variety? I am interested to know if i can control the UV on my Maximus viii formula, i currently own two Magnetic RGB LED Strip – 60cm plan to change out the top one to use this new one for UV cooling, looking for a review/demo on this product before i am buying!!! Hi Thanh – unfortunately our Hybrid LED strips are actually 5 pin, while the ASUS AURA headers are only 4. This means that you won’t be able to connect these strips to your motherboard. They currently only work with the included remote control. any plan on releasing Magnetic backing or just Foam Adhesive? Thank you Admin for quick relay, what are the pin out for the 5 pin connector? is three of the pin B, R, G and other two pin for +? would the RGB work if daisy chain to an old RGB light connected but UV won’t? If my motherboard doesn’t have a USB 2 header nor RGB header can I still use this? Hi Ethan – no problem. Just purchase a WideBeam Hybrid LED Kit and you’ll be able to operate these via the included remote control. The strips are powered via SATA power, so as long as you have a free SATA power connector from your PSU, you’re good to go! Hi there, I got my hybrid strip the other day. Unfortunately, I didn’t realize that it won’t be possible to power the UV lights off of my Asus Aura header until after purchasing. I’ve got a free USB header on my mobo. Because of the way I want to run the chain, it would be far better to power it off of this header instead of off sata. Is there an adaptor that would enable me to do this? In the meantime, will I be able to use the RGB function of the strips if I connect the 4 pins from the Aura header to the chain? Hi James. Because our Hybrid LED strips are 5 pin, and the ASUS AURA LED headers are 4 pin, they aren’t compatible. We currently don’t know of an adapter that can let you connect our hybrid strip to this connector. You could possibly connect the +, B, R and G pins to the AURA header to power the RGB part of the hybrid strip, but because of the different pin definitions, you’ll need to be very careful when attempting this. I just purchased the Cablemod 30 Hybrid Kit but it does not contain any installation instructions and I can’t find anything on you internet site. What’s the deal? Please advise. I’m looking for some information before I buy this kit, I have a ax1200i PSU and an ASUS x-99-e ws mobo. I know its impossible to power using the headers, but can I power using the PSU, will I lose any functionality. I’m looking to purchase a 60cm kit for the top and either another for the bottom or 2x30cm to build a loop for the bottom/sides. Is the remote wireless? I’m guessing I need to run a sensor externally or close the window aperture in my corsair 750d if it is to get a signal. Can anyone assist. Hi Louise – you can certainly power the LEDs using your PSU with the included SATA power cable. You won’t be able to connect these to the ASUS AURA headers since they are 5 pin, which means that it won’t be “in sync” with the LED colors of your motherboard, but you can indeed have full functionality with the remote control. The included remote control uses RF technology, which means you don’t need to run the sensor externally for it to work. In fact, direct line of sight is not necessary and you can just point the remote in the sensor’s general direction and it will accept your commands. Hope that helps! So to be clear: WideBeam RGB LED Strips work with ASUS Aura, but WideBeam HYBRID RGB LED Strips do not. Correct? Hi John – Yes, that is correct. Hybrid LED Strips have 5 pins, while ASUS AURA only has 4. Thanks. I would like to see an interface developed allowing ASUS Aura to control the hybrid. Please pass that on to development. I would like to second the request to make the hybrid lights Asus Aura compatible. Can you cut these to make them shorter? My gigabyte z270x gaming 8 has two 5 pin headers named RGBW. I assume it will do the job, just wanted to double check. Hi – yes, you’ll be able to control our WideBeam Hybrid LED strips with the RGB Fusion headers on your Gigabyte motherboard. I bought a 30Cm hybrid Wide Beam UV/RGB kit (B01N68381E , CM-LED-30-D30RGBU-RK ). Can I add a 60cm B01N22BFA1 , CM-LED-60-D60RGBU-R to the end of my 30cm strip and run with the same power suppy/remote? Hi Cliff – yes, that will work no problem! can this be used on msi pro carbon x370? No – the MSI Pro Carbon X370 only supports RGB strips (i.e. 4-pin). Our Hybrid LED strips require 5-pin LED headers. Instead, try our WideBeam RGB LED Strips which are indeed compatible with this motherboard. What is the controller number for this strip, please? Hi Florin – we offer a kit which comes with a controller: https://cablemod.com/product/cablemod-widebeam-hybrid-led-kit-60cm/. If your motherboard has a 5-pin LED header (i.e. Gigabyte), you can also control this strip directly through their software. Hope that helps! Where can I obtain an instruction booklet for the 40 button remote?